Don't even ask for food at 3:00pm ! 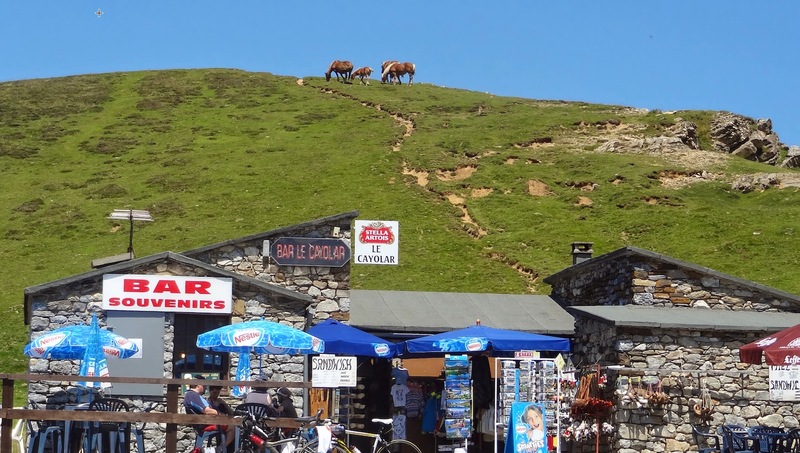 The life of a cyclist on vacation in France flows something like this. Wake up at 7-8:00am, check for any aches or pains, wonder if your chamois has dried from washing the day before. Peek out at the weather and shuffle down to breakfast in your flip-flops to begin adding calories of yogurt, fruit, bread, jam, cheese, maybe eggs, or some cold meats. Come to life over a cup of café au lait and open up the map onto the table to check out the highly anticipated bike route for the day. We then inspect the table of food items wondering if we should eat more food. Next we all look at each other and silently declare that the preparation should now begin. Without setting a time, every cyclist goes through their routine of getting ready, and somehow ends up standing at their bike, or ready to depart, about the same time. The ride commences. By now it is 9:30(ish). We ride for 2 hours, we might stop at a cafe for another shot of espresso and then continue to ride for an additional 2 hours. 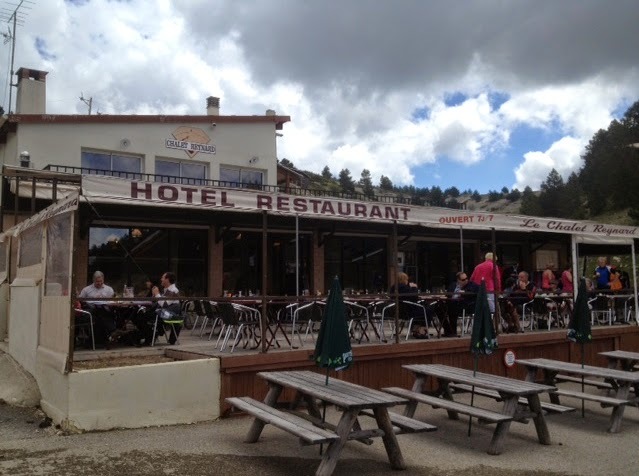 We arrive back at the hotel, B&B, or car, get out of our chamois, put back on our flip-flops and find ourselves looking for food round about 3:00pm. Wrong wrong wrong. There will be no food found in France at 3:00pm, or even 4:00pm. Ce n'est pas possible. There will be food found at 8:00pm. But by then a cyclist could starve. This is why I am promoting Figolus (kidding, although we go through bags of them because of this 3:00 dilemma thing). I am simply trying to warn a fellow cyclist that in France, lunch is served from 12-2:00pm. During this time most shops and banks will be closed, some supermarkets will be open. Restaurants will be open. Restaurants stop seating for lunch about 1:45pm. Drinks only will be served at cafes from 3:00-6:00pm. Dinner will begin around 7:00, most people eat dinner betweem 8:00-10:00pm. In Colorado we are able to find lunch anytime between 10:00-5:00pm, and then happy hour begins with food and drink specials before dinner time (4:00-6:00pm). A little warning that you might be caught out during your travels to France unless you keep this French time schedule in mind. 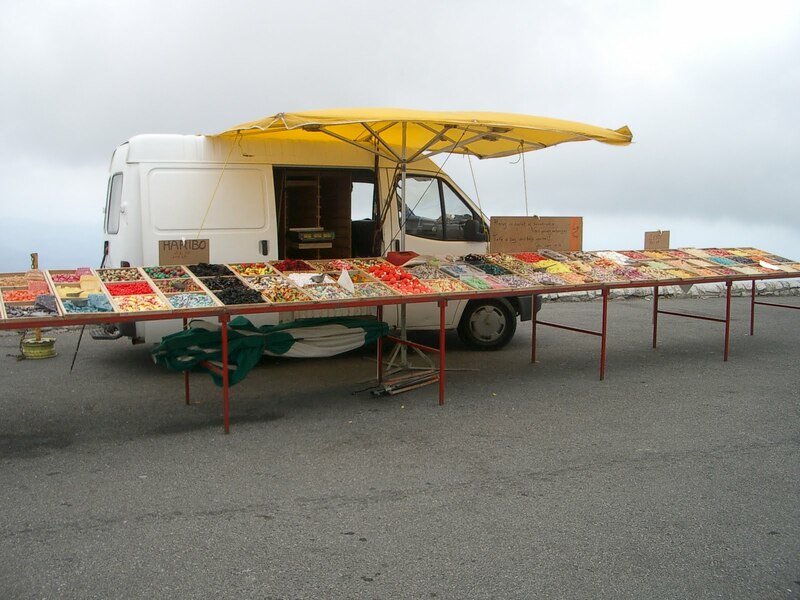 The best cure we have found for this possible period of starvation is to go to the grocery store to buy snacks, to visit the morning markets to buy fresh fruit and bread, and buy Figolus! Okay, simply be prepared. Eating well and drinking well only makes the next day on your bike that much better. 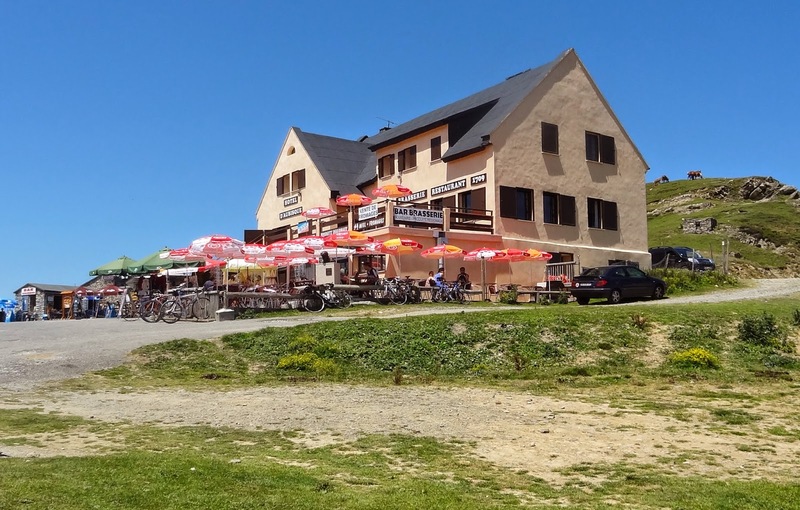 Another great idea is to have lunch when you reach the top of a Col, or plan a destination ride to a town for lunch, then ride home. 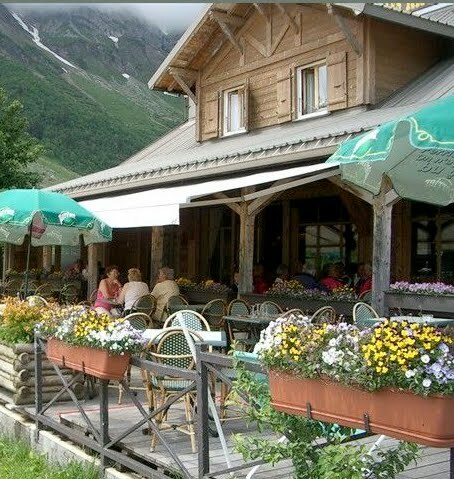 This is the cafe at the top of the Col des Aravis in the Grand Bornand area of the Alpes. Well worth a stop. 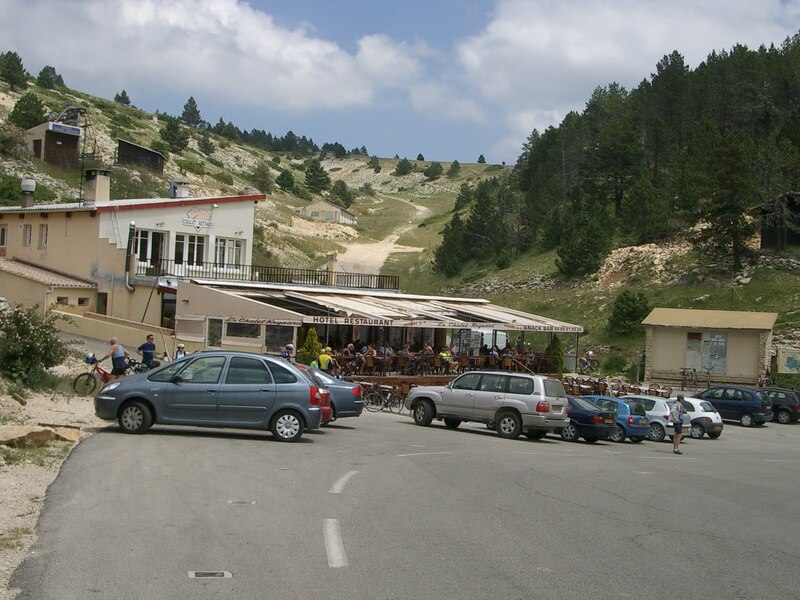 This is Le Chalet Reynard, the cafe midway up the climb to Mount Ventoux. A super fun place to stop for cyclists. 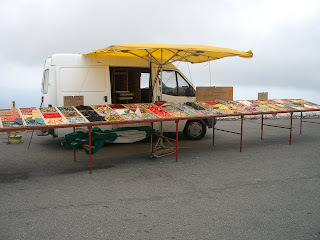 This is the cookie man at the top of Mount Ventoux. I don't think I'd actually recommend eating these cookies, but simply seeing him there tells me I have summited! 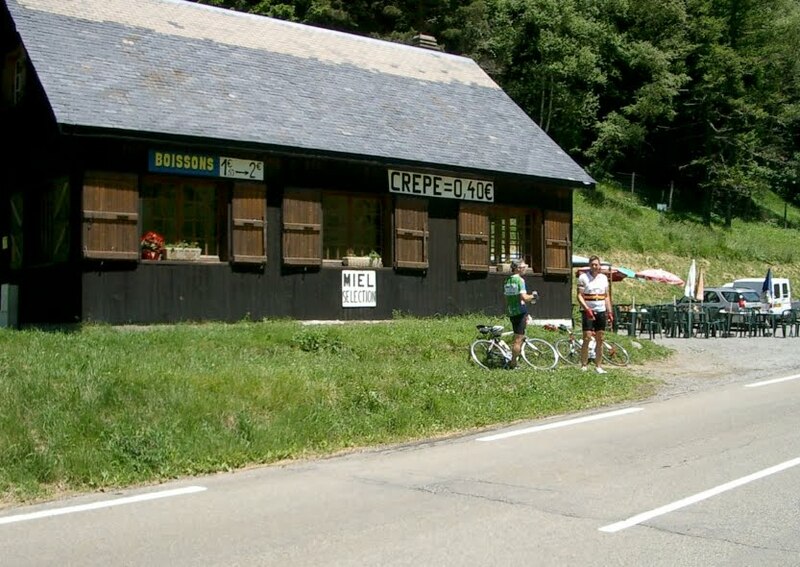 Supposedly this is a great Crepe place at the top of the Col de Peyresourde, but I haven't tried it yet. We instead descended into the town of Arreau for a riverside picnic. 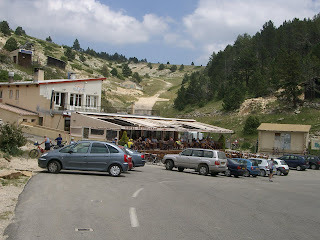 I did an earlier post on Food For the Cyclist in May 2010.